Figure 1.1 is a block diagram of a digital PLL (DPLL). The purpose of the DPLL is to lock the phase of a numerically controlled oscillator (NCO) to a reference signal. The loop includes a phase detector to compute phase error and a loop filter to set loop dynamic performance. The output of the loop filter controls the frequency and phase of the NCO, driving the phase error to zero. One application of the DPLL is to recover the timing in a digital demodulator. In this case, the phase detector computes the phase error from the complex I/Q signal. Another application would be to lock to an external sine wave that is captured by an A/D converter. A basic DPLL model is shown in Figure 1.2. 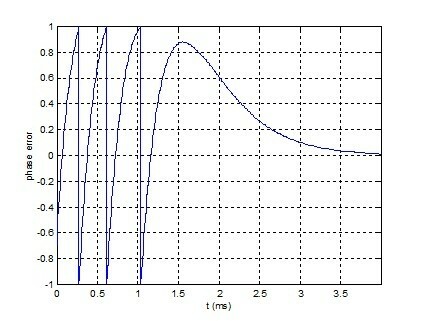 In this model, the reference signal and the NCO output are both phases. The phase error is simply the difference of the reference phase and the NCO phase. This is the DPLL model we will use here. (As an example of a reference phase, if a reference sine wave were applied to a Hilbert transformer, the phase of the Hilbert I/Q output could be used to generate the reference phase: phi_ref= arctan(Q/I) ). We will use Matlab to model the DPLL in the time and frequency domains (Simulink is also a good tool for modeling a DPLL in the time domain). Part 1 discusses the time domain model; the frequency domain model will be covered in Part 2. The frequency domain model will allow us to calculate the loop filter parameters to give the desired bandwidth and damping, but it is a linear model and cannot predict acquisition behavior. The time domain model can be made almost identical to the gate-level system, and as such, is able to model acquisition. As shown in Figure 1.2, the DPLL contains an NCO, phase detector, and a loop filter. We now describe these blocks for a 2nd order PLL [1, 2]. To keep things simple, all blocks use the same sample frequency. This discussion deals with the phase of sampled sine waves. For background, see Appendix B. Here f is the frequency, n is sample index, and Ts is sample time. To create an NCO, we just implement the above equation. But rather than generate phase in radians, we remove the 2*pi to give phase in cycles. Then the range of phase (renamed u) is 0 to 1. The implementation in Figure 2.1 is an accumulator that rolls over when x >1, with input f*Ts = f/fs. The output u is phase in cycles. The output y is a sine wave at frequency = f. The cosine function is generated using a lookup table or CORDIC algorithm. For our DPLL we make two modifications, as shown in Figure 2.2. We add input Vtune and scaling Knco to allow an offset from the center frequency, f. Typically, Knco << 1. Also, we removed the sinusoidal output; only the phase output is needed in the model. With the sine output removed, we refer to the NCO as a phase accumulator. A note on quantization: In a digital implementation, u must be quantized to a reasonable number of bits. For simplicity, we have not included quantization in this and subsequent models, but it can easily be added. Figure 2.2. Phase Accumulator for DPLL. 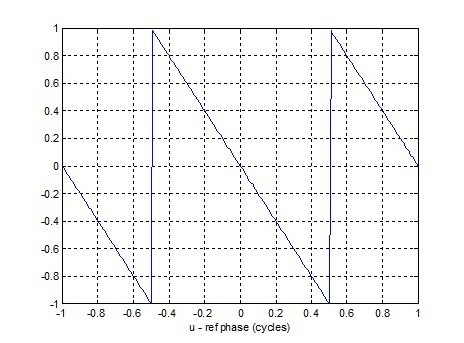 u = phase in cycles. Kp = 2 in units of cycle-1. A plot of phase detector output vs. phase error is shown in Figure 2.4.
where pe is the phase error. KL and KI determine the damping and natural frequency of the PLL. We will show how to calculate KL and KI in Part 2. Putting all the components together, the DPLL time domain model is shown in Figure 2.6. 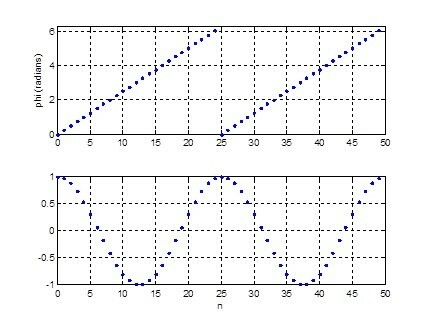 The first example has initial frequency error less than loop natural frequency, and the second example has initial frequency error much greater than loop natural frequency. The formulas for KL and KI to obtain the desired natural frequency and damping will be covered in Part 2. Example 1. Initial frequency error < Loop natural frequency. Loop natural frequency = 5 kHz and NCO initial frequency error = -800 Hz. For this case, the loop behaves as a linear system. Note we have allowed Vtune to exceed [-1 1], rather than clipping at that level. NCO Initial freq error = -800 Hz. Initial ref phase = 0.7 cycles. 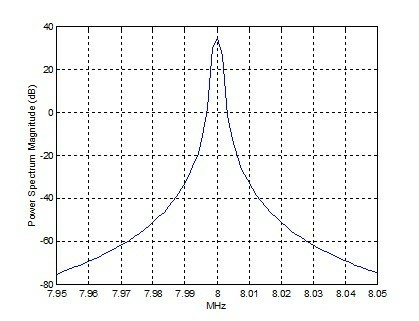 fn = 5 kHz, ζ = 1.0. Example 2. Initial frequency error >> Loop natural frequency. Loop natural frequency = 400 Hz and NCO initial frequency error = -4 kHz. For this case, the phase detector repeatedly wraps due to the large initial frequency error. Thus the loop is highly non-linear during acquisition. Note the time scales of the plots are longer than for the previous example. NCO Initial freq error = -4 kHz. Initial ref phase = 0.7 cycles. fn = 400 Hz, ζ = 1.0. 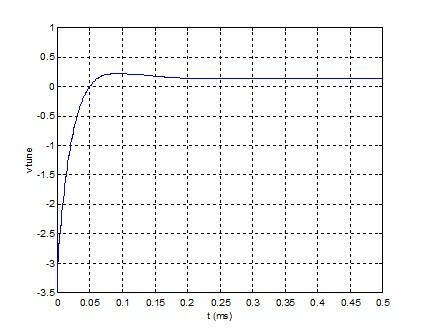 % Digital PLL model in time using difference equations. Top: phase phi of sampled cosine wave (radians). 1. Gardner, Floyd M., Phaselock Techniques, 3rd Ed., Wiley-Interscience, 2005, Chapter 4. 2. Rice, Michael, Digital Communications, a Discrete-Time Approach, Pearson Prentice Hall, 2009, Appendix C.
In my experience of QAM receivers, it is typically possible for the clock recovery loop to lock without any frequency acquisition aids. This is because the frequency error is not so large compared to the loop bandwidth. On the other hand, the carrier loop typically requires an acquisition aid, such as sweeping. One interesting point made by Gardner in section 8.3 of his book "If the loop filter contains a perfect integrator, pull-in will be accomplished no matter how large the initial frequency error. (This statement neglects clipping limits; the loop clearly cannot pull in a signal that requires excessive control voltage to the VCO)." This applies to the digital PLL's we are discussing. As a practical matter though, it can take a loop too long to acquire. Thanks. I hope you like part 2 of the article. I found both Parts 1 and 2 short, to the point, and very valuable. I own the Floyd Gardner book - this information augments the information in the book very well. I learn best when I either have to code up algorithms myself or can see what others have done, allowing me to "play around" with the various components to gain insights into the functionality. MATLAB was a very good choice. Thanks, Neil. Hi, glad you liked it. Let me know if there are any other DPLL topics you'd like to see addressed. I have a question regarding the Loop Filter. 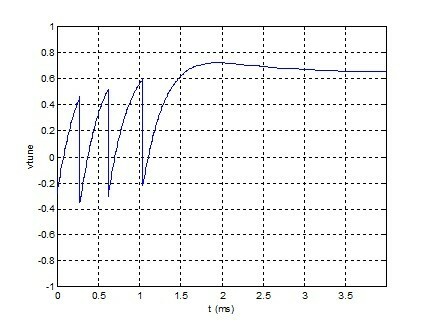 Appendix A loop filter calculations do not seem to account for the delay element in the lower path of loop filter. As per the Figure 2.6, KI*pe should arrive one sample later than KL*pe at the input to adder. Could you please explain. Sorry for the late response; I have been moving and living out of a suitcase. Are you asking about Appendix A of Part II? I think the delay of the loop filter is taken into account in the overall closed loop transfer function. In any case, a delay of one sample has negligible effect on the PLL because the sample rate is much higher than the loop bandwidth. 1) why you use a rollover on the phase detector? What is its function? 2) why you define the phase in cycle/s? 3) where I find the explanation about your conversion from Laplace transform to z-domain? Thank a lot for your answer and for you work. 1. The nature of phase is that it repeats every 1 cycle or 2pi radians. The inputs to the phase detector roll over every +/- pi radians. For example, the NCO phase output goes from 0 to 2pi (0 to 1 cycles), then it rolls over. Since this is the case, there is no point in having the phase detector output range exceed +/- pi. 2. Using phase in cycles is convenient, because the phase range is then +/-1, which works well for digital implementation. But it is not necessary to do it this way, you could also use radians. 3. I guess you mean s --> (z-1)/Ts. I discuss this in part 2, Appendix C, but I'm not very rigorous. Another way to look at it: a discrete-time integrator has H(z) = Ts/(z-1), so you can then claim that 1/s --> Ts/(z-1). You may want to find a textbook explanation of a discrete integrator in the Z domain. I made a correction to the above reply. Thanks for this serie on DPLL. I struggled alot in finding a matlab implementation with good explanation axed towards real discrete hardware implementation. Much appreciated. I am working on implementing a DPLL in my FPGA starting from your blog series here. I went through part 1 implementation in matlab and I have a simple question: Why is the roll over part of the phase detector necessary? Without the rollover, I do observe kind of a chaotic pattern at the "pe" output instead of a good looking triangle wave. Intuitively, it's probably better in a closed loop system but do you have an exact reason to not use "pe" right away? If you don't do a defined rollover of the phase error, it will sooner or later hit positive or negative full scale and either saturate or roll-over, depending on the design. I don't think that will work. Note that when the PD rolls over at +/- 1/2 cycle (+/- pi radians),its output has a dc component that drives the loop to lock. (See for example ref 1). Thanks for your answer. Indeed, the most of the frequency content of "pe" after the rollover is near DC, compared to the spectrum before the roll over. If I understand correctly, since the loop filter is limited in term of bandwidth, that kind of signal is preferred for the DPLL to lock and maintain a stable system? During acquisition, the shape of the spectral content is not of concern, as long as the PLL is driven to lock. If the frequency error is large with respect to loop bandwidth, the dc component at the PD output will change slowly, and it will take the loop a long time to lock. 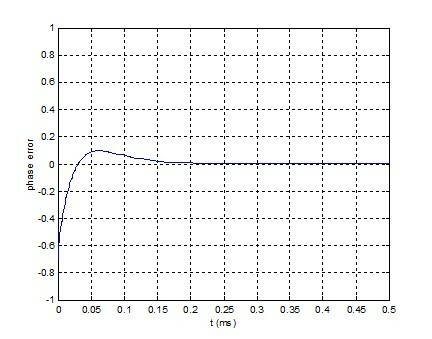 After lock, the PD time-domain output should be zero, with an occasional pulse up or down to maintain lock. This pulse is then integrated by the loop filter to maintain the correct tuning "voltage". In the frequency domain, higher frequency noise on the PD output is attenuated by the loop filter -- As you have probably have seen, an example loop filter frequency response is shown in Figure 6 of Part 2 of this series. Neil Robertson worked at Scientific Atlanta, Cisco, and ST Micro doing RF design, System Design, and DSP design for cable TV set-top boxes and cable modems. He is retired and lives in Columbus, Ohio.